Caqui, pronounced as 'KAKI' - the Japanese persimmon is a delicious and delicate fruit. It resembles a tomato and is often mistaken by those who see it for the first time. It has very less calories and is rich in Vitamins A, B1, B2 and E and also Iron and Calcium. In Brazil there is a variety called 'Chocolate Caqui' , which is orange in colour on the outside and the pulp is brown. Since Caqui is a seasonal fruit, we can freeze the pureed pulp for later use to make desserts and smoothies. To make it easier I freeze it in zip lock bags containing 1 cup measure in each. 1. Peel the caquis and puree the pulp. It should be about 1 cup. 2. Sift the flour, salt, cinnamon and baking soda together. 3. Cream the butter and sugar until fluffy. You can use any sugar.. icing sugar or finely granulated sugar or brown sugar. I have used organic cane sugar. 4. Whisk together eggs, lemon juice, vanilla essence and brandy. 5. Add this to the sugar-butter mix and blend it. 6. Now fold in the sifted flour mix little by little with a spatula, turning in one direction lightly until all the flour is used up. 7. Mix the nuts and raisins. 8. Grease a mould with butter and spoon the mixture into it. Make sure it is filled half or little more because the pudding almost doubles later. 9. Pre-heat the oven. Pour water in a bigger mould and place the mould with the mix in it. Cover it with a foil. 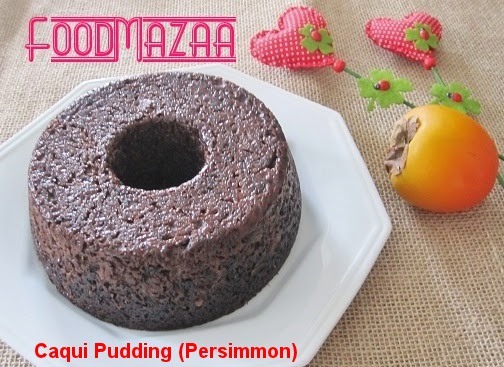 Bake this pudding for one and half hours on medium temperature. PS: It may take a little less time depending on the size of the oven (maybe one hour and 15 minutes) Do not open the foil to check it until at least 45 minutes to one hour. Looks yumm..I've never tried this. Love this fruit and it wont stay longer in fruit basket to make pudding with them. Perfectly made & looks delicious too!! New to me,moist and great texture,looks yummy. at first i thought it is a tomato.. good to know about new fruit.. I have seen Persimmons in the grocery store and was unsure what to do with them. Your recipe sounds fantastic! What a delicious treat! 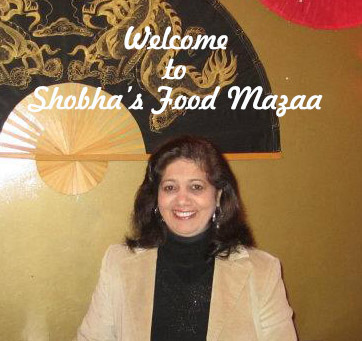 Delicious persimmon pudding love it shoba. Thanks for sharing with Hearth and Soul blog hop. I am hightlighting this recipe.